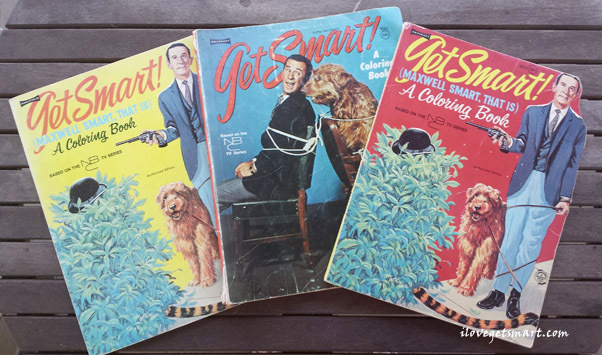 Three of the four Get Smart coloring books from 1965 and 1966. Coloring is all the rage at the moment – adult coloring that is. In that vein, and since I’m a bit swamped with all kinds of work and chores, the time is due for an entry on the Get Smart coloring books. 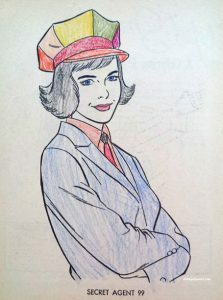 A colored in Agent 99 in her chauffeur’s outfit from the pilot episode. Now referring to these collectibles in the plural, while technically accurate, isn’t exactly correct. Produced by Saalfield Artcraft, there were four Get Smart coloring books with publishing dates of 1965 and 1966. They each had different covers, but the guts on the inside were the same. There was the yellow one — and the red one that looked like the yellow one except it was die cut along the top corner. There was also the blue one that didn’t look like either of the first two, but there was another red one that looked like the blue one. Are you confused? Good. The first yellow/red cover design is Max and Fang with the dog’s leash wrapped around him. The second blue/red cover design is a photo of Max and Fang tied to chairs. Through some resourceful ebaying, I finally managed to score three of them. All have been colored in and that is typical when finding one of these. The art was drawn by comic book artist Sam Burlockoff. Born in 1924, his comic book work spanned the 1940s into the 1950s, primarily as an inker. In addition to illustrating other Saalfield coloring books, he also did illustration work for encyclopedias. Among the syndicated comics he worked on in the 1960s were Flash Gordon and The Saint. Burlockoff passed away in 2007. 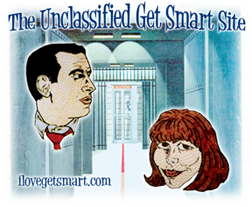 In terms of continuity, Max is drawn to look like Don Adams – a few of the pages are take-offs on Get Smart publicity photos. Agent 99 looks cute, yet she does not quite look like Barbara Feldon. The Chief is given a full head of hair and a mustache. He looks more like Chief Quimby from Inspector Gadget rather than Ed Platt. As for Saalfield Artcraft, its parent, the Akron, Ohio-based Saalfield Publishing Company, was once one of the largest publishers children’s materials in the world. It began publishing children’s books in 1899. Under Saalfield Artcraft, it produced the likes of coloring books, paper dolls and puzzles. The company went defunct in 1976, however, Kent State purchased the company’s library and archives in 1977. A peekaboo into the coloring books. We’ve got 99 doing a new hair color, a sweet fluorescent hot air balloon and Max and 99 chasing after some sort of flying saucer. As I mentioned before, if you get your hands on one of these – or any vintage coloring book for that matter – don’t expect them to be mint. I’m a bit of a research nerd, so I actually find that aspect interesting. The colored pages are a like a time capsule of a kid’s day back in the 60s. Which pages did they color? What colors did they pick? Did they stay in the lines? I noticed some patterns. The first couple pages were usually always colored – then the coloring would peter off with the exception of a few random pages in the middle and at the end. Not that I can blame those choices – the best illustrations, in my opinion, were on the first couple pages. 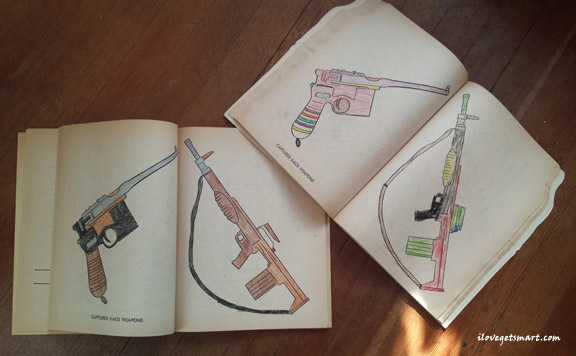 In two of the coloring books I found that the previous owners had colored in the pages displaying the “Captured Kaos Weapons.” Hmmm…. Two different approaches to the Kaos weapons. One young artist went with realism while the other gave the guns a more colorful look. The coloring habit has recently proved to not just be a past time for little ones. If you walk into a store — and, at this point, one of any kind — you will likely find a shelf of adult coloring books. Inside will be pages of intricate patterns and repetitive detail ranging from paisleys and flowers to mandalas and animals. I own several and they are a fun and relaxing way to spend time. I also have a bit of a compulsive art habit and spend all kinds of spare time drawing my own illustrations. Periodically I post my art on Instagram – feel free to take peeky-boo there (@ahaverstick86). For fun, I did my own take on a couple of the Get Smart coloring pages by adding some… enhancements. Well, the kids got to color, so I wanted a turn too.